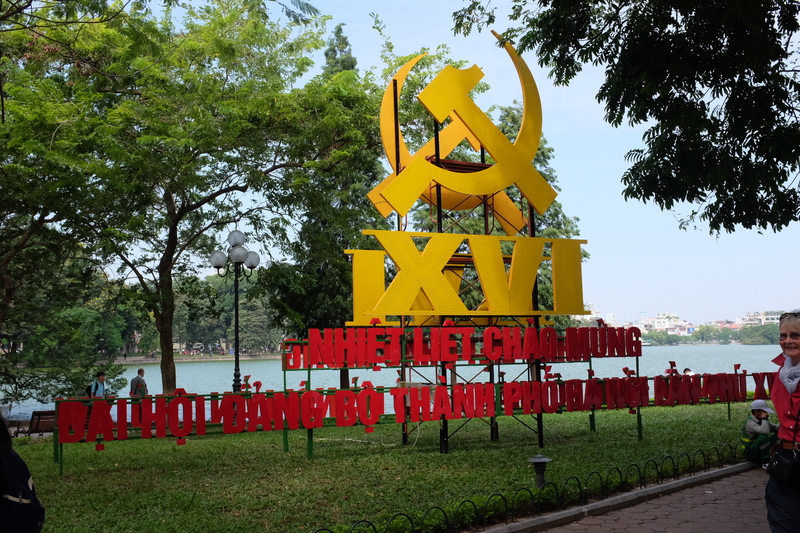 Upon arriving in Vietnam one is struck by how large the government looms in daily life. The national flag is ubiquitous. 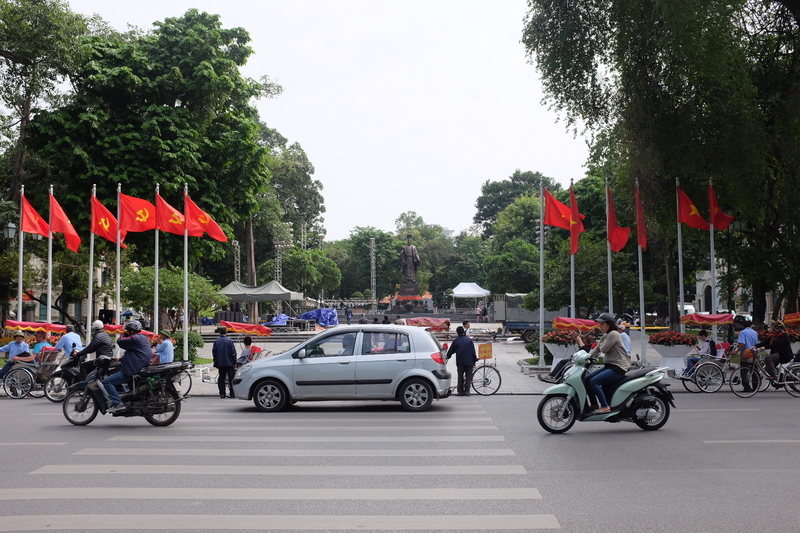 The Communist Party’s hammer and sickle symbol flies everywhere. The Party has been in power with no political opposition for decades and wields tremendous control. There is a massive state surveillance apparatus. One observer of Vietnam’s military estimates that one person in six works for a security force. The volume of motorbikes on the streets makes an impression too; motorbikes are undoubtedly the country’s principal form of transportation. They flood the roads. And everyone here seems to wear a helmet (in contrast to Cambodia where most seem to ride with a bare head). The helmets look stylish! 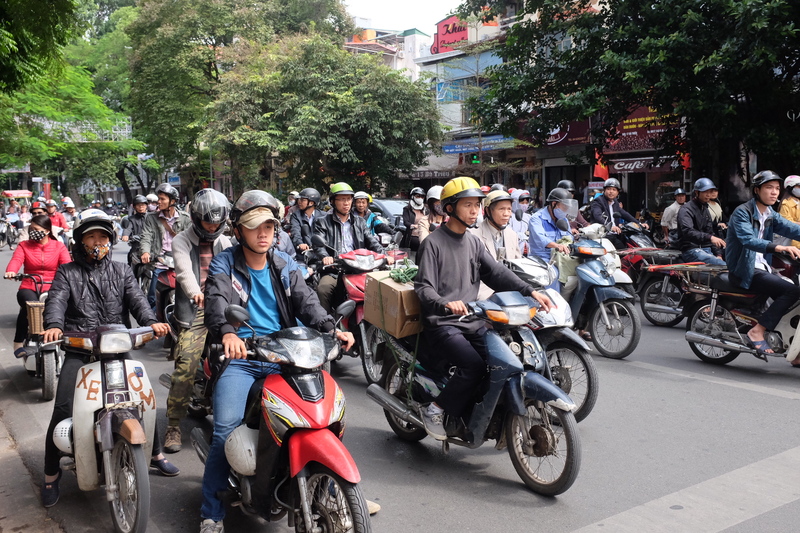 Until 2007 Vietnam had no laws requiring motorbike helmets. Everyone found that they were too hot and cumbersome to wear. Women complained that they messed up their hair. But at the time there were 30 motorbike-related deaths per day and annual lost earnings and health-related costs totaled $885m. In 2007 the government passed new legislation requiring motorbike drivers to wear helmets. But how does the state get 90m people to comply with an unpopular law? The government began with public sector employees (there’s a lot of them) and rural areas. Then it moved to the cities, using a combination of co-option, coercion, propaganda and punishment. The legislation only took months to implement and there is near-universal compliance. (As an interesting sidebar, some initial compliance was in name only; a few drivers wore cooking pots on their heads). 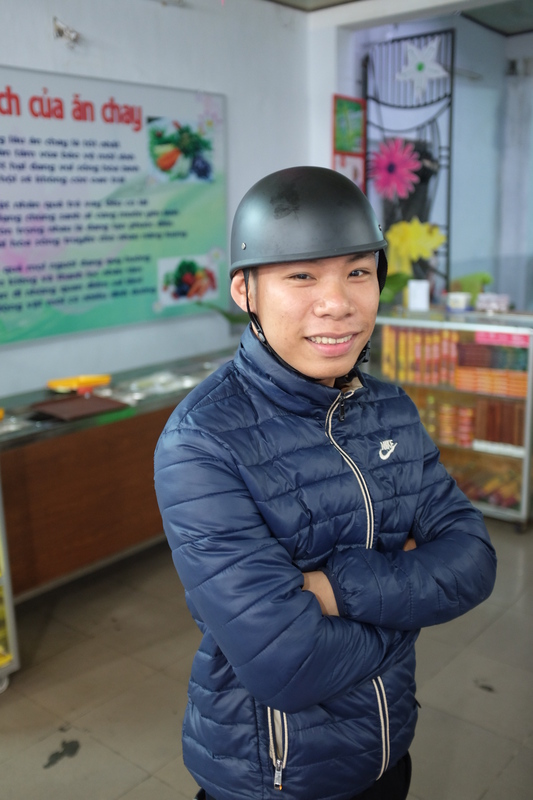 And with 90m people looking for helmets, an obvious business opportunity emerged, leading to a thriving industry for stylish motorbike helmets. 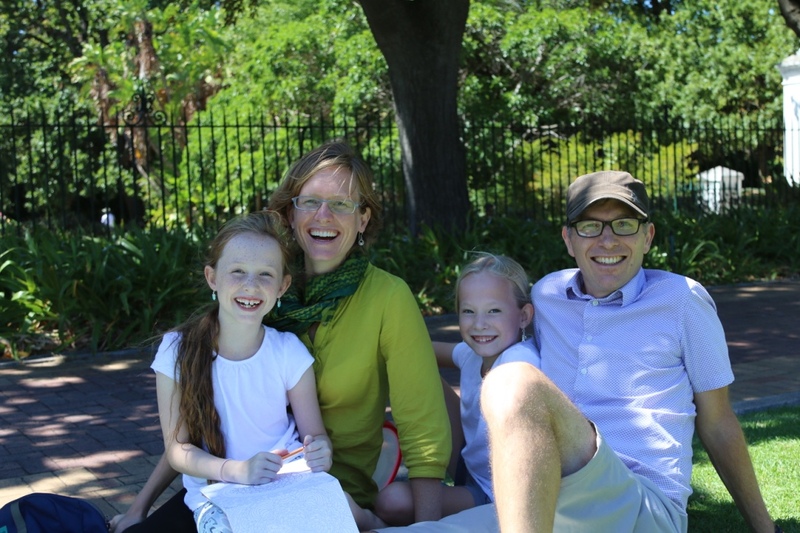 A year after implementation there was a 10% decrease in accidents; a significant saving in both lives and money. But helmets don’t fix everything and people still ignore traffic rules, speed and drink and drive. Which brings us to the view from our balcony on the seventh floor in Da nang. Every day, we drink our morning coffee overlooking the street below. There’s a school nearby and as time for class nears, more and more motorbikes speed through the intersection. Like almost all intersections here, there are no stop signs. A common traffic phenomenon here is for drivers turning left to cut into the oncoming lane, then turn left into more oncoming traffic on the inside, and eventually move to the right lane. I understand the urge to do it; I’ve tried it on my bike. It’s simply a bad idea. See below. Motorbike on left is (with 2 passengers) on the inside of oncoming motorbike. Oncoming motorbike (on left) squeezed between both left-turning motorbikes. It’s enthralling to watch, in the way that seeing a gruesome crash enthralls. Every few minutes brings a close call. But when there is an accident (in the two weeks we’ve been here we’ve only seen one), at least they’ll be wearing helmets. Upon your return, we’d like you to implement the helmet law with our teenager population. Nigel, Our Laws here I agree are lax. Helmets in my opinion should be worn on any moving vehicle. Be it a bike, scooter, moped, skate board ect. I deal with Brain Injury too many times when it could be avoided. Too often human “Bravado” prevails. This like you needs to change. Keep up the posts. So interesting Couz! !